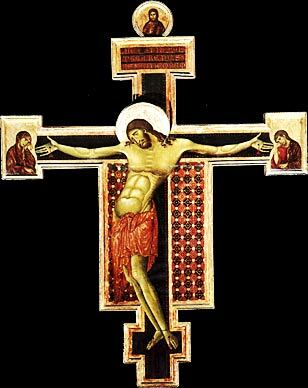 The Crucifixion is among the most frequently depicted subjects in all of Byzantine and Medieval art. Though Christ’s solitary figure has always served as a powerful devotional image, the artistic style in which the Crucifixion was painted varied over the centuries, as it reflected the changing state of Christian thought. 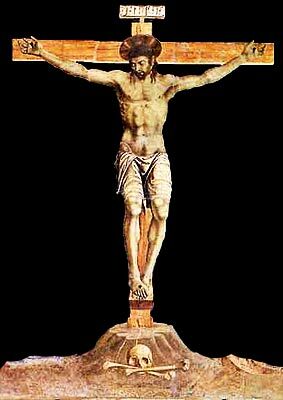 In the four centuries after Christ’s death, the Crucifixion was rarely represented in Christian art, as the religion remained outlawed under Roman rule. It has been suggested that early Christians were also loath to depict a gruesome form of execution suffered by the worst criminals. as an example of how He suffered for the redemption of mankind. Icons from the 7th and 8th centuries, showing the image of the crucified Christ with His mother and John the Evangelist at the foot of the cross, can still be seen at the monastery on Mount Sinai. While image-making was banned during the iconoclastic era (of about 725 to 842), the importance of images portraying Christ’s death began to flower in late Byzantine art. Pathos was not the goal in these early images, which were not used to display the reality of Jesus' death but to demonstrate the glory of Christ, his victory over death and the promise of salvation. In these images, Christ was depicted alive and opened-eyed, the triumphant savior sometimes wearing a crown or made to look like a Greek or Roman emperor with a commanding presence. Other times, he wears a colobium, a sleeveless tunic, either out of reverence or possibly to suggest his dual role as both priest and victim. His arms are almost always at right angles to his trunk, as if in a liturgical gesture. In one example from the eighth century, blood flows from his side but without any indication that this is painful. 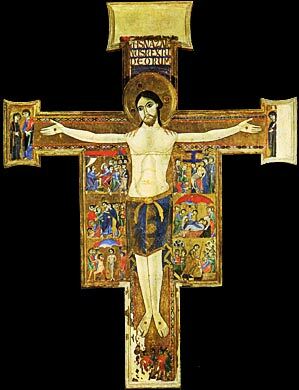 The Pisan Cross, which now hangs in the Uffizi, is a work squarely in the late Byzantine tradition, as well as one of the earliest surviving Italian panel paintings. The artist and its exact date are unknown, but the rigidly vertical position of Christ is typical of Byzantine iconography, with its stylistic conventions of emotional austerity, elegance and solemnity. In the Byzantine world, figures were mere symbols of the faith, and the depiction of realistic human anatomy was seen as a violation of Church commandments. Christ looks out from this panel in a flat, emotionless way, and there is no modeling of the anatomy. There are also no signs of physical suffering on his body — his calm outward gaze is meant to symbolize victory over death. His firm, outstretched arms do not bend under the weight of his body, but suggest the welcome or acclaim by a victorious leader. to hang above the church’s altar, features oversized end panels as seen in many Byzantine reliquary crosses. This work was conceived for instructive purposes, and so is historiated, or encircled with traditional narrative paintings that would be recognized by the common people. The stories told here illustrate many scenes from the life of Mary and Jesus. As the Medieval era began, the manner in which the Church transmitted its message to the faithful took a new turn. In the Roman Catholic Church of the 12th C, the Passion came to dominate the worship, and the story of the crucifixion of Jesus held special appeal in this evangelical culture, preoccupied with mysticism, death and demonic spirits. In Cimabue’s large Crucifix for the Church of San Domenico in Arezzo, a departure is seen from the flat Byzantine traditions. Cimabue was an innovator in representing facial expressions, and his figures were painted with more life-like proportion and shading. Here, he introduces a new feeling of humanity to the Christ figure. In this solemn crucifixion, decorated with lavish ornamental patterns, Jesus is now depicted as the dead Christ, focusing the onlooker’s attention not on the authority of the divine figure but on the suffering of the crucified man. Jesus’ head inclines to the right and sinks into His collarbone, while His knitted brows and tightly-closed lips give His face an expression of great suffering. While Jesus’ hands are painted in a flat, stylized way, a small amount of blood is seen to flow from the wounds in His hands. Cimabue painted the figure’s pelvis far to the left, giving an emotional curve to the whole figure. While still lacking much anatomical detail, protruding stomach muscles are displayed in three horizontal bands. A loincloth now replaces the earlier robe and is emphasized with a subtle play of realistic folds and highlights. Adding to the emotion, the grief shown by the figures of Mary and John at the ends of the crossarm offer a comment on Christ’s suffering, inviting the faithful to join with them in mourning. (Giotto, 1335) in the 13th and 14th C as expanded trade and universities spread humanistic ideals throughout society, and art followed suit in more accurately reflecting the physical world. Later, as the Black Death devastated the continent, artists’ focus on the cruel and gruesome aspects of the Passion may also have been an attempt by their Church patrons to connect and respond via Christ's suffering to the collective trauma of the age. Giotto’s innovative painting technique, as seen in this Crucifix from the Church of Santa Maria Novella in Florence, stressed observation from nature over traditional iconic symbolism. In his work, which was the first to break fully from the Byzantine style, the depiction of human beings gained a naturalness, along with a brand new sense of three-dimensionality and physical presence. By concentrating on emotion and realism over symbols of the divine, as well as by creating recognizable attitudes, Giotto imbued Christ’s body with a heavy, earthly, human presence which was to become a prototype for succeeding generations of artists. 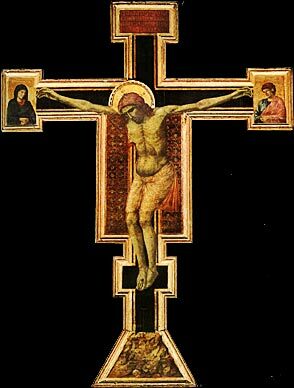 Compared to Cimabue’s, Giotto’s crucifixion shows Christ in a much more natural pose. In the Santa Maria Novella Crucifix, the head of Jesus falls forward; hair hangs down His right side. The facial features are now relaxed in death, His lips realistically parted. Giotto drew the hands in correct perspective, with thumbs turned downward and fingers slightly bent, and a realistic jet of blood flows from the wound in Christ’s side almost down to His knee. The body hangs with the pelvis only slightly bent to the right, and the straight torso is shown in accurate anatomical detail. Even the feet hang realistically limp. the focus has clearly moved from storytelling and symbolism to the emotional condition of the central character. Toward the end of the Middle Ages, crucifixions become more literal about the violence suffered by Christ's body. Artists also discovered the laws of perspective, which allowed painters to create three dimensional scenes and which became a basic tool in the early Renaissance as artists aimed to reproduce the world as it was designed. The Great Schism of the Catholic Church reduced its influence, and artists’ patrons were now increasingly drawn from wealthy noble and merchant classes, who allowed them greater freedom of expression. Finally, the late 14th C was a time of great progress in other arts and sciences. The rediscovery of ancient Greek and Roman texts and philosophies led directly to the spirit of intellectual inquiry and humanism of the Renaissance. Andrea del Castagno was one of the most influential Florentine painters of the early Renaissance, championing the realistic portrayal of the human body as a three-dimensional solid by employing light and shadow to create a strong relief. Translating Donatello’s sculptural themes into paint, he focused on bodily movement as well as facial expression and dramatic tension, giving his figures the look of sculptural forms. This crucifixion, from a fresco in the Church of Sant’Apollonia, shows Christ in great anatomical detail. His body has power and dominates the space. Castagno combined perspective with a harsh lighting to bring great drama to the scene. The composition is nearly identical to earlier crucifixions, but this work lays greater stress on realistic detail. The Christ figure is no longer as dignified, but now has the hardened physique of the working, peasant class. On the ground at the foot of the lifelike, wooden cross, Castagno adds a skull belonging to Adam, whose sin, with Jesus’ death, has now been cleared.